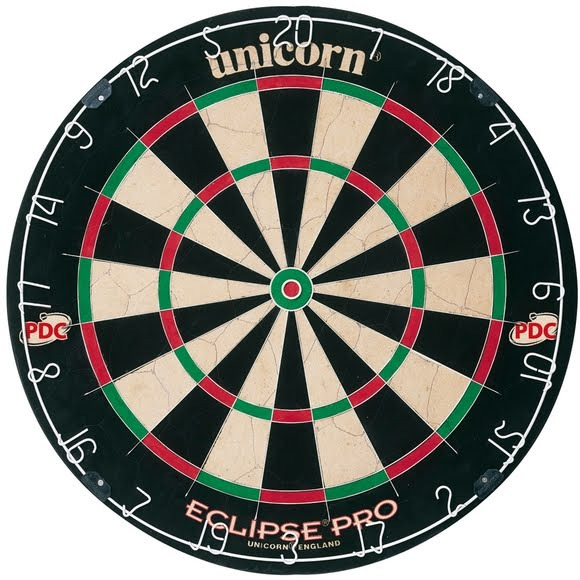 The Unicorn Eclipse Pro has been the PDC dartboard of choice for all major Sky televised events, creating over 5,000 of TV exposure for the brand globally. It is a traditional bristle dartboard manufactured with over 50 individual circular packs of sisal, referred to as "biscuits". The Unicorn Eclipse Pro has been the PDC dartboard of choice for all major Sky televised events, creating over 5,000 of TV exposure for the brand globally. It is a traditional bristle dartboard manufactured with over 50 individual circular packs of sisal, referred to as "biscuits". These are bonded around the edge with a tape and, when compressed together, glued to a wooden backboard and sanded to form the playing surface. Actively improves scoring averages and checkout ratios and minimising bounceouts.